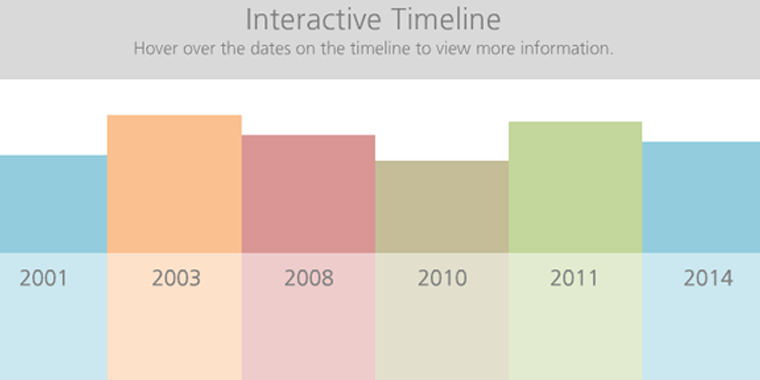 I recently built an interactive timeline file for Storyline based on a request from a community member. This week, I want to recreate a similar download file in PowerPoint to give our Studio and PowerPoint users equal opportunity. To keep my interaction aligned as closely as possible to my Storyline file, I used the “mouse-over” actions available in PowerPoint. I picked colored rectangles for the columns in the timeline, then used a light gray rectangle containing a simple title and instructions for the header. For the hover-over effect, I created a duplicate slide of the timeline with one column highlighted for each of the columns on the timeline. This way, when learners hover over a column, it displays the corresponding slide with the highlighted column and additional information. I've put the download the files here so you can see exactly how I put it all together. I also created this video tutorial to break it down a bit and explain at a high level how I created it. Do you have any tips and tricks of your own for using any of the PowerPoint actions? Have you used PowerPoint actions such as mouse-overs before? If so, please leave a comment below; we love to hear your feedback! I've learnt something new today, I didn't think PowerPoint Actions would work in Articulate Studio or is that a new feature in Studio'13? Great voice-over as well. Did you record it during the video or after? Thanks Nicole, Coincidentally I wanted to use this mouse over effect for my submission last week! Just have a question please... I don't seem to have this 'articulate tab' in my powerpoint, I guess it is only available for those who have a functional articulate software running on their system right? Hi Daniel! Yes that is correct, you need to have Articulate Presenter installed to see the Articulate tab in Powerpoint. Thanks Nicole, unfortunately i have already used up my 30 days free trial and stuck with PowerPoint! Anyway, thanks for responding...used the mouse over effect for my entry for this weeks challenge on virtual tour. Check it out! https://www.dropbox.com/s/atj70rybi35ne4n/Virtual%20tour.pptx Thanks for sharing! Thanks Nicole! Is this doable with only a series of slides within a presentation? Whenever I preview my hover slides they play one by one rather than going back to the original slide. Thanks again! Great video. Thank you very much Nicole. I have learned something new today. This was awesome! I was looking for something else when I stumbled over this. Definitely worth revisiting the older posts here. I never even knew PowerPoint had this capability. I can't wait to try this out. And the video tutorial was perfect. I would have never figured out how to do this without it. Thanks Nicole!